Is there a more exquisite flower than the Orchid? From Phalaenopsis to Dendrobiums, and from Oncidiums to Cymbidiums, we’ve got you covered! Orchids are very temperature-sensitive; store at 50-55 degrees Fahrenheit. 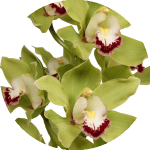 With the exception of Cypripediums, Orchids should be stored with the stem secured in a water tube filled with sufficient supply of preservative solution. Avoid getting water on the petals, as this can cause spotting. Store in the shipping carton or upright in a rack, taking care not to bruise them or allow them to run against rough surfaces or other flowers. Shredded paper is used to support and protect Orchids. Orchids are ethylene sensitive and should be stored away from sources of ethylene. After receiving the shipment open box(es) immediately, cut the stems and put in room water temperature. Fill container at least halfway and store stems in a 50-60 degrees environment. Avoid storage in direct sunlight. In the event the flowers go soft, float orchid stems in lukewarm in a large basin or bathtub to revive. When used in foam make sure the orchid stems have direct access to fresh water either via water tube or make sure stem is submerged in water. Remove wrapping sleeve, remove water tube, re-cut stem, and place in a container with fresh water, or keep the water tube on the stem and be sure to check the water level every day. The proper temperature to store orchids is 50-60 degrees. When used in foam make sure the orchid stems have direct access to fresh water either via water tube or stem is submerged in water. Stems and flowers can also be floated in room temperature water if flowers are soft or dehydrated. Remove Leis from package upon arrival, mist Leis with water place on paper towels and cover with paper towels to absorb excess water. Place Leis in a large plastic bag and refrigerate, do not stack multiple bags, and keep at least for 1 hour in refrigeration before use. Keep cool at 50-55 degrees. Before wearing the Lei place on paper towel for 30 minutes in order for the moisture to dissipate.